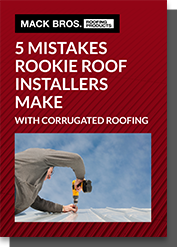 Take a look at our ‘5 Mistakes Rookie Roof Installers Make with Corrugated roofing’ e-book to learn the best practice for DIY roofing. Quality roofing solutions Australia wide. All of our roofing and guttering products can also be made in Copper, Stainless Steel and Aluminium aside from the standard Zincal, Galvanised and pre-painted steel like Colorbond®, Colorbond Ultra®, Colorguard® and Colorguard Plus®. More than six decades attest to Mack Bros quality of service and workmanship. To find out more about our range of products, please do not hesitate to get in touch with us today. We are always happy to provide you with further information and answer any queries.